Data will not help you if you can’t see it where you need it. Or can’t collect it where you need it. Upon these principles, wearable technology was born. And although smart watches and fitness trackers have become almost ubiquitous, with in-body sensors on the horizon, the future applications of wearable computers hold so much more. A trusted reference for almost 15 years, Fundamentals of Wearable Computers and Augmented Reality goes beyond smart clothing to explore user interface design issues specific to wearable tech and areas in which it can be applied. Upon its initial publication, the first edition almost instantly became a trusted reference, setting the stage for the coming decade, in which the explosion in research and applications of wearable computers and augmented reality occurred. Written by expert researchers and teachers, each chapter in the second edition has been revised and updated to reflect advances in the field and provide fundamental knowledge on each topic, solidifying the book’s reputation as a valuable technical resource as well as a textbook for augmented reality and ubiquitous computing courses. From a technology perspective, much of what is happening now with wearables and augmented reality would not have been possible even five years ago. In the fourteen years since the first edition burst on the scene, the capabilities and applications of both technologies are orders of magnitude faster, smaller, and cheaper. Yet the book’s overarching mission remains the same: to supply the fundamental information and basic knowledge about the design and use of wearable computers and augmented reality with the goal of enhancing people’s lives. Woodrow Barfield, PhD, JD, LLM, has served as professor of engineering at the University of Washington, Seattle, Washington, where he received the National Science Foundation Presidential Young Investigator Award. Professor Barfield directed the Sensory Engineering Laboratory, where he was involved in research on sensors and augmented and virtual reality displays. He has served as a senior editor for Presence: Teleoperators and Virtual Environments and is an associate editor for Virtual Reality. He has more than 350 publications and presentations, including invited lectures and keynote talks, and holds two degrees in law. 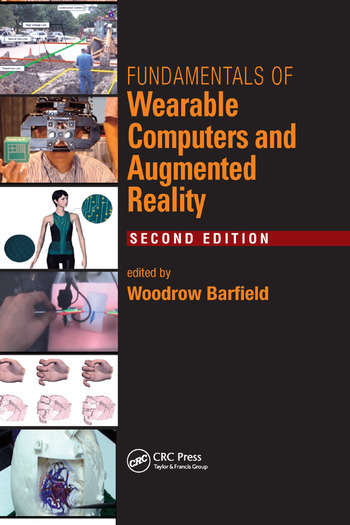 "For researchers in this area, the book is amazingly inspiring, containing a huge range of fantastic material on the topic of wearable computing and augmented reality. Its content re?ects the skills and experience of a number of long-term researchers in the ?eld, and each chapter feels extensive and mature, yet fresh and up to date. This is not a book that will guide you step by step in setting up a wearable computer demo system, but rather a book that will provide you with a remarkable overall vision on the topic, showing you what the best researchers have done so far and therefore offering you the unique opportunity of ‘standing on the shoulders of giants’ of wearable computing." "Portions of the book would be of great interest to many HF/E professionals and students as preparation for applications and issues to be addressed in the relatively near future. The technology section would be especially useful for new researchers and developers starting in the field... "
"...this book contains broad information related to wearable computers and augmented reality. Most of the chapters present cutting-edge research activities. Thus, the required level of readers is intermediate to expert....researchers or graduate students of computer-human interaction or virtual reality could take advantage from it." "The book covers a variety of research and development issues....anyone who is interested in wearable computers and augmented reality could do well to start with this work." "...the papers presented interesting ideas and topics for further development...one might feel that yet again here is a technology looking for an application and that we ought to be working hard on developing and appropriate role for people in relation to these devices."